What a great way to start my week by attending a public lecture hosted by the UCLA Department of Physics and Astronomy – “The Coming Revolution in Fundamental Physics” by David J. Gross, winner of the 2004 Nobel Prize in Physics. Dr. Gross is Director of the highly respected Kavli Institute for Theoretical Physics and Professor of Physics at U.C. Santa Barbara. 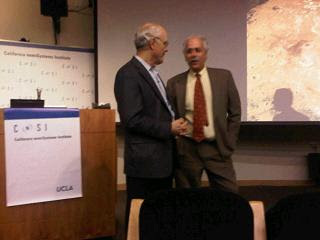 The late afternoon lecture was held at the NanoSystems Institute on the UCLA campus. The auditorium was standing room only due to the significant stature of Dr. Gross who is an international authority on string theory. I grabbed an early seat directly in front of the podium (inset picture is from my cell phone) and as the luminaries arrived, I got to witness all the hoopla. Apparently Dr. Gross has quite a following in the physics academic community as there was an endless stream of physicists to offer greetings and well wishes. The talk was a great overview of the current state of particle physics and string theory. Gross made it clear he prefers to call string theory a “framework” instead of a theory because of how it provides a foundation for so much surrounding quantum gravity. He also made a big point of how this field is at a pre-birth stage – “The most important product of knowledge is ignorance.” I really appreciated that honest perspective. He beckoned to the audience to realize that string theory is poised to do so much – determine the fate of black holes, determine the origin of the universe, work toward a unified theory, and much more. Gross is, however, quite single focused in his outlook on string theory, ignoring the validity of anything contrary. For instance, when asked about a leading alternative field of quantum gravity – Loop Quantum Gravity, he exclaimed with a note of disgust, “LQG isn’t even worth talking about.” In his talk he also alluded to “two very bad books” that came out in defiance of string theory. Of course he was talking about “Not Even Wrong,” and “The Problem with Physics” (see Science Lifestyle Blog post), again dismissing the competition. All in all, I really enjoyed the lecture. What’s not to enjoy with a Nobel Laureate in my midst. The lecture scheduled for one hour, stretch on to nearly two hours. At one point, the moderator moved to tell Dr. Gross he was running over in time, and someone in the audience shouted “Keep talking!” I was prepared to listen as long as he wanted to talk. After the lecture, the department hosted a nice reception over at the IPAM building, complete with selections of food, beer and wine. Dr. Gross had a constant circle of disciples around him asking probing questions about theoretical physics. Imagine my surprise to see a local Westwood Village bum (who I normally see eating from trash cans in front of Starbucks next to the Village Theater, and who is also quite mad) in the crowd nudging up to Gross asking nonsensical and inane questions that made no sense at all. I think the department should invest in some bouncers for the next lecture with a Nobel Prize winner! Gee whiz that is a funny story about the hobo asking physics questions. he he he.